I'm so glad you stopped by to visit with me! 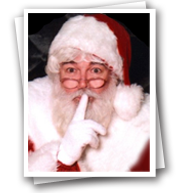 I am now taking reservations for Live Personalized Phone Calls from "The Real Santa." Time slots are filling up fast so I encourage you to book your call as soon as possible. I really do love children and I look forward to speaking with each of them personally. As you are filling out the order form, you will want to tell me important facts about your child. As you know, children are amazed that Santa knows so much about them! Some who are on the borderline of not believing in Santa are convinced when Santa tells them about their brothers and sisters, their pets, their hobbies, etc. I can also speak with them about things they need to improve on (such as fighting with siblings, etc.) I also love to commend them if they are doing well in school, sports, chores, etc. I'm sure you will agree that children need to be commended for their accomplishments. Your entire family will remember this call. To quote one grandma, "I’m not sure who enjoyed the call the most, me or my grandchildren." Don’t miss this opportunity ... remember time is short and there are hundreds of children who still want to speak with Santa. Give the gift of a life time - a live personalized call from Santa to a child or even a lonely senior citizen. They dearly love Santa, too. I look forward to hearing from each and everyone of you! And I wish you all a Merry, Merry Christmas!